Jaipur is one of the best tourist places the country has. It is known for its eye-popping architectural designs. Jaipur tells us about the luxurious lives of the kings. There are many tourist places in Jaipur which one should visit. The beautiful palaces and forts have a long history added to it. An apt name has been given to Jaipur the City of Palaces. The place is not only famous for palaces and forts it is also famous for bazaars. The traditional bazaars add charm to the city. The bazaars range from the ethnic wears to flamboyant footwear’s. The city has also got some beautiful temples which can add to your long list. Here is a list of top 10 Jaipur Tourist Places which will surely captivate you to the pink city. You will be mesmerized by the beauty of these places. The list starts with the unique Jantar Mantar. Jantar Mantar-A proud UNESCO World Heritage Site and a place worth a visit. Jantar Mantar simply means ‘Calculating instrument’. The monument has a Collection of as long as nineteen Architectural astronomical instruments. The List does not end here. It has got the world’s largest stone sundial which adds to its glory. The monument was built by Sawai Jai Singh. The wonderful monument is near to historical places i.e. City Palace and Hawa Mahal. 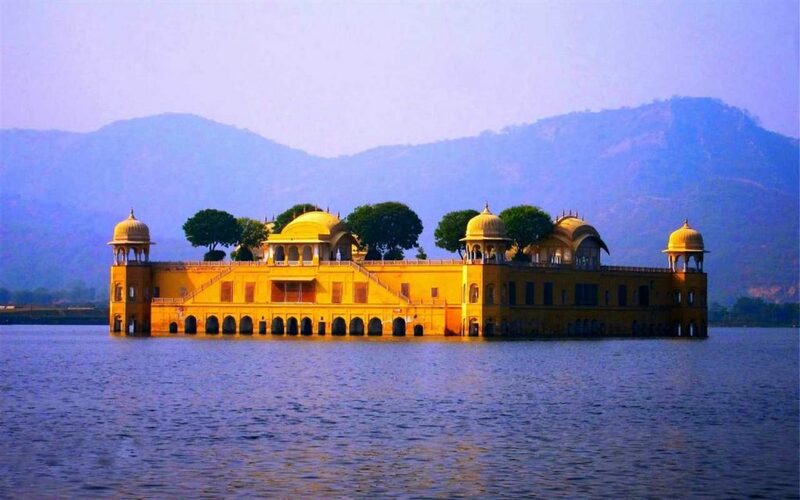 JAL MAHAL– A wonderful Mahal situated in between the Man Sagar Lake. The Jal Mahal was refurbished in the 18th century by Maharaja Jai Singh 2. There is a beautiful view of the Hills even. It is a 5 storied palace. The top floor is only visible when the water is brimful in the lake. The palace is built by red sand stone. In the night the scenes of Jal Mahal are mesmerizing. You cannot just afford to miss that view. Hawa Mahal – A unique 5 storied monument which is located in the heart of the city. It has as many as 953 windows through which air flows. The Hawa Mahal is said to have a structure of Lord Krishna. Constructed by a mixture of red and pink sandstone. At stone’s throw there is a popular bazaar known Sireh Deori bazaar. Sireh Deori bazaar is known for the leather products. After exploring the Hawa Mahal you can spend your whole day in the bazaar. Nahargarh Fort– Built in 1734 by Maharaja Sawai Jai Singh 2. Nahargarh Fort is undoubtedly one of the most visited places in Jaipur. It is located on the outskirts of Jaipur. The view from the Nahargarh Fort is just speechless. You can just see the whole city from the top of Nahargarh Fort. The Nahargarh Fort has been named after Nahar Singh Bhomia. The explanation to the term Nahargarh has been given as Home of Tigers. Amer fort– The fort is constructed by a mixture of red sandstone and marble. The fort is called the Amer Palace also. The fort was home to the Rajputanas and their families. In front of the fort is a lake called Maota Lake which is a major source of water to the Amer Palace. The fort has a wonderful view surrounded by hills. It is in an area of around of 4 square kilometers. The Amer Fort is near to the Jaigarh Fort. City palace– Located in the Heart of the City. City Palace is a place to be in for the tourists. City Palace has two more mahals in it including the Mubarak and Chandra Mahal. City Palace is a wonderful palace with lots and lots of new things coming to your way. The city palace was built by Sawai Jai Singh 2. The city palace is constructed by pink and red sandstone. It will take couple of hours to take a look at the City Palace. Birla Mandir– Birla Mandir is one of the best temples to be at in Jaipur. It is one of the most popular attractions of Jaipur for the tourists. Made by the finest quality of white marble. Birla Mandir is dedicated to the Lord Vishnu. The temple was constructed by the Birla Group of Industries in 1988. Visitng this temple will be a treat for the tourists. The visit to this temple will add lot of beauty to everyone’s trip. Jaigarh Fort– The fort is nearby to the Amer Fort on the outskirts of Jaipur. A fort built by Sawai Jai Singh 2 in 1726. The fort is situated on the Hill of Eagles of the Aravalli Range. The fort portrays some sublime scenes from the top. The fort is enclosed by the thick walls of red sandstone. The fort is worth the visit with so many wonderful places. Albert Museum– It is the oldest museum of the state. The museum was opened in 1887. The museum is named after King Edward VII. The specialties of the museum are paintings, carpets, ivory, stone, metal sculptures, colorful crystal works etc. It is a Museum which one should visit for totally new and different experience. Sun Temple– It is also known as the Surya Temple. A place which does not attract many tourists but a temple worth a visit. The temple is mainly famous because of wonderful view of the sun set it portrays. A very quite temple where can spend some quality time and remember the almighty. You can even enjoy the beautiful view from the temple of the whole city. The list is quite long but these are the 10 best jaipur places among the lot which includes wonderful temples, forts, and palaces. The Paris of India is one of the major tourist attractions in the country. Jaipur is the place for you to be in the winter season. The city is at its best in the chilly season. There are some popular dishes even which you can try. There are wonderful small eats found near the bazaars. The food small eats outs offer you are lip smacking. So people go explore the pink city and know about your country more and more.